Hi, everybody. I have created these two tables mostly based EPA highway dyno test scores. The reason I'm using EPA highway dyno test scores instead of EPA rated range is that EPA rated range is manipulated in two ways: 1. Different multipliers, 2. Voluntary reductions. I will edit this message and add more information over time. Does the green indicate estimated values? I see that only one Model S, the dual motor/with aero UWC and all standard range Model 3s have their miles colored differently. Hi, @Kizzy. Yes, the green numbers are estimates. For the Model 3, we only have the EPA dyno test scores for the Model 3 LR RWD with 18" wheels and aero covers off. Therefore I calculated estimates for all the other options. To calculate the numbers for the Model 3 55, I used the cell counts. The Model LR battery has 4416 cells and the SR pack has 2976 cells (source). That's 2976/4416= 67.4%. However, reducing the scores by that ratio would show the range for a Model 3 55 as if it was a software limited 75 but still had the same weight. Therefore I considered the weight reduction from 75 to 55 as well. To calculate AWD numbers, I have looked at the Model S 75 vs 75D. So either I can really afford a 100D versions by then or it for sure remains Model ≡ for me!! Hi, @Michael Russo. On Reddit, I saw too many people considering to buy a Model S 85 instead of a Model 3 LR and I was tired of explaining to them that they are comparing the wrong cars. The Model S 85 is really only comparable to the $35,000 Model 3 SR and the Model 3 LR is comparable to the Model S 100D. The Model S 85 is the Tesla model that suffered the most from overly optimistic advertising. The battery size was 9% over advertised and the range numbers were 15% over advertised. Why? My guess is, in 2012 Tesla was a small company and they were expecting competition from other car companies. When talking about patents, Elon said that they expected other car companies to copy Tesla and come up with their own versions of 200+ miles EVs and then crush them with their massive production numbers. Of course, this never happened but it explains why Tesla might have over advertised the Model S 85 battery size and range numbers in 2012. Interestingly this had a negative effect for many years. the 85 kWh pack has only 77.5 kWh usable capacity. So when Tesla came up with a larger battery that had 81.8 kWh, they had a problem with the name. The 85 should have been called the 80 and the new pack should have been called the 85 but that name was already taken, so they called the new battery the 90 kWh even though it has only 81.8 kWh usable capacity. The newer 75 and 100 kWh packs don't have this problem. Model 3 doesn't have this problem either because Tesla says 75 kWh but the battery has 78.3 kWh usable capacity. They are under advertising it. So, to clear misconceptions about old Model S vs new Model 3 range numbers, I have decided to create these tables. Later I added the range at different speeds because I was getting lots of questions about that. This project is not perfect because we don't have all the data yet. I will create new versions of these tables when we have the Model 3 SR EPA data. Thanks, @Troy , all very useful! Hi, everybody. I have created these two tables mostly based on EPA highway dyno test scores. Why use EPA highway dyno test scores? The reason I'm using EPA highway dyno test scores instead of EPA rated range is that EPA rated range is manipulated in two ways: 1. Different multipliers, 2. Voluntary reductions. The manipulation happens after the dyno test is done and before they release the official EPA rated range. More information about these manipulation methods can be found here. Therefore EPA rated range numbers are not comparable but EPA highway dyno test scores are. Consumer Reports has not tested the Model 3 LR yet. We only have the EPA dyno test scores for the Model 3. Therefore I calculated what the range would be if/when Consumer Reports tests the Model 3 LR. The calculation is this: 454.64 * 235/358.49= 298 miles. That's the range at 65 mph. Other than the Model S 75D, Consumer Reports also tested the range of the Model X 90D. You can read more about it here. After I had the numbers at 65, to calculate the numbers at 70, 75 and 80 mph, I used the first graph Tesla published here. I've used this video for the S/X supercharge percentages. 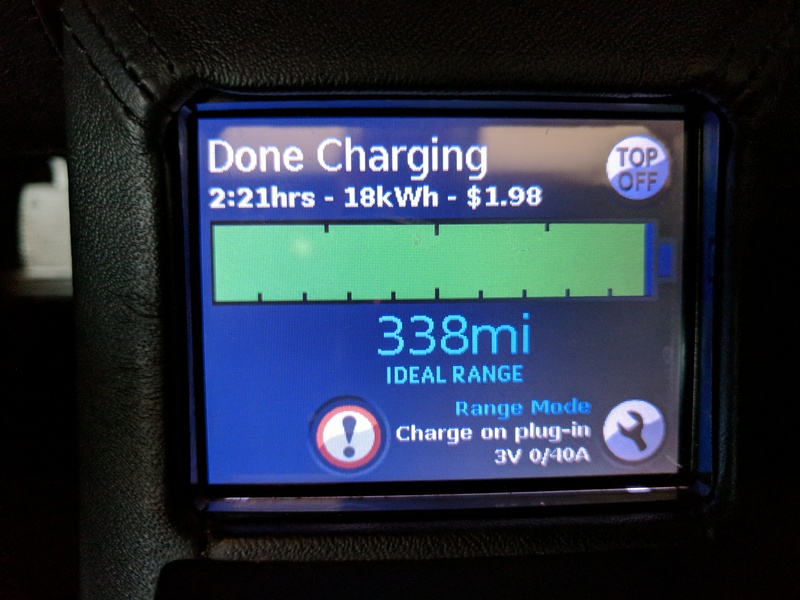 For the Model 3 LR, I've used this calculation 170/310= 54.8% in 30 minutes based on the 170 miles in 30 minutes number Tesla published here. 1. On page 4 here you can see a photo of the car during the test. 2. On page 16 here, it shows these two numbers: 9.95 HP for Model 3 with 18" and 11.13 HP for the Model 3 with 19". The ratio is 9.95/11.13= 89.4%. Now let's look at the Model S RWD numbers. On page 5 here, it shows these numbers: 11.45 HP for the Model S with 19" wheels and 12.78 HP for the Model S with 21" wheels. The ratio is 11.45/12.78= 89.6%. The difference is almost identical and the Model S in this test doesn't have aero covers. Therefore the almost identical difference suggests that neither the Model 3 nor the Model S had aero covers. In this formula, you can change 50 mph to 65 mph, then do the same calculation with the other A, B, C numbers for 18" wheels and then compare the results and you get 10.44% difference at 75 mph. For #2, I used an estimated 6% improvement because there is no definitive data yet. In 2012 Tesla released aero covers for the Model S and people were reporting 5 to 10% improvement. I figured 6% would be a safe bet. I added the purple columns to display the range after 5% degradation because 5% looks reasonable based on survey data. If you look at the degradation chart here for miles and here for km, you can see that the range drops to 95% at 45,000 miles or 72,500 km. For the Model 3, the drop to 95% will actually happen at a 25% higher mileage than the Model S because the Model 3 is more efficient and requires fewer charge cycles to achieve the same mileage. The biggest problem I think is the Model S 85 data. The EPA test was done in February 2012 and it was never repeated again. However, Tesla improved the Model S 85 in 2013, 2014 and 2015. Therefore the numbers you see are for the 2012 Model S 85. It shows 219.7 miles range at 65 mph but I think the range was ~15 miles more in later years. Why do you use the consumer reports score, when they admit they only charged it to 90%? Are you compensating for this factor? Why do you use the consumer reports score, when they admit they only charged it to 90%? That's not exactly correct. Consumer Reports' test procedure is explained here. The screenshot below is from that page. By the way, you've asked me the same question before here. Well, Dang it! So you are saying with the 19" Sport Wheels, I will get nowhere near 300 miles on a road trip...back to the hand wringing over wheel size....again! But seriously, very nicely done. What this all tells me is that if you are concerned mostly with range and supercharger charge speed, then the Model 3 LR is actually superior to both the Model S and X. For me, this far outweighs any acceleration superiority the big brothers may have. By all accounts it seems that the little sibling is a beast when it comes to long legs, at least until the Roadster comes out! We make sure the car is in its version of normal drive mode, not extended range mode, because our goal is not to see what’s the maximum range an EV can get when pushed to its limits, but rather to see the total number of miles a driver should expect under normal circumstances. In addition, Consumer Reports turned off regen. For the Bolt, this is not a handicap because the brakes still use regen. The Model S brakes are friction only. Wow...thanks to all those who contributed to creating this data. Fascinating and creating in simple data that at 65 mph the base mode 3 with 19 inch wheels will travel 199 miles when new. That's thre or four hours behind the wheel...on the road...that's about how long I last behind the wheel before wanting a pit stop. I imagine many consumers will opt for the larger rims as well just for the aesthetics.. The increase in speed on the highways drop in mileage was insightful too.. It is the 4th bullet point (from this exact article) that explains what they did. I don't understand what you mean. What does it explain? @MelindaV, since you agreed with that message, what exactly did you agree with? I'm trying to understand the argument. That the article you referenced charged to the ‘recommended’ 80-90%, not 100%, as would be the ‘normal’ daily use case. 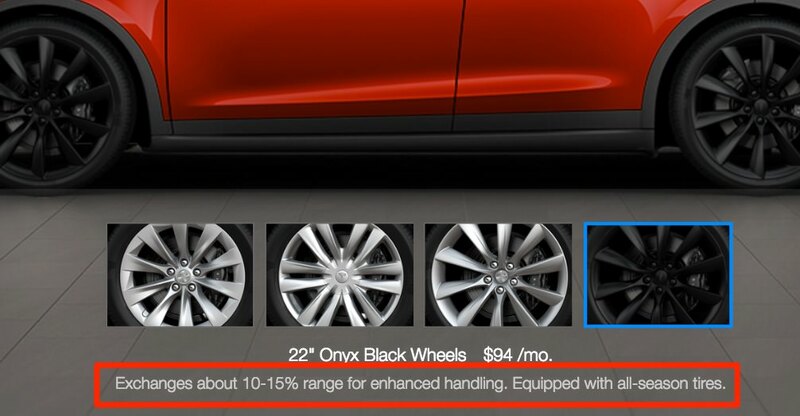 The closest Tesla came to telling the truth about the range penalty with larger wheels was when they had the following footnote on the Model X design studio. However, they were still downplaying the difference. The actual difference for the Model X is 22.5%, not 10-15%. The reason the difference is twice as much as the S or the 3 is that the 22" MX rear wheels are wider than the 20". S or 3 wheels have the same width regardless the wheel size. Later they removed that information because after all Tesla is trying to make money with the larger wheels. For more information on this topic, check out this article and my message here on Reddit. My username there is /u/Teslike. How did you come up with that conclusion? The article is here. 1st bullet point says fully charged and 4th bullet point says range mode was not on because they were trying to demonstrate normal use. Where does it say charged to 90%? Did you completely skip the part where they said they make sure the car is fully charged? I added a screenshot to message #8. The cars are charged to 100%. See the 1st bullet point here. First, we make sure the car is fully charged. In the Roadster range mode might refer to charge level but in a Model S, range mode is a setting that reduces maximum power for climate control and battery heating. It is not related to the charge level. The range mode setting is irrelevant here because climate control was turned off anyway and battery heating was not needed because the weather was warm enough. More about Range Mode can be found here. Also, check out this video where they compare Bolt's and Model S' CR score to the EPA score. Such comparisons wouldn't make any sense if they were not charging to 100%. Similarly, Model S and X scores were compared to EPA rated range in a different CR article here. How did you come up with that conclusion? The article is here. 1st bullet point says fully charged and 4th bullet point says range mode was not on because they were trying to demonstrate normal use. Where does it say charged to 90%? In the Roadster range mode might refer to charge level but in a Model S, range mode is a setting that reduced maximum power for climate control and battery heating. It is not related to the charge level. The range mode setting is irrelevant here because climate control was turned off anyway and battery heating was not needed because the weather was warm enough. In addition, did you completely skip the part where they said they make sure the car is fully charged? Also, watch this video where they compare Bolt's 238 mi CR score to the 235 mi EPA score. Could be my mistake. I thought I remembered in comments shortly after this article, that CR only charged to 80 or 90%. I assumed that extended range mode meant using 100% of the battery. It looks like this is not the case. Sorry, but thanks for your reply clearing up my confusion. Your detailed posts are some of my favorites. I assumed that extended range mode meant using 100% of the battery.